When in 1999 I began writing for The New York Review of Books ... my stance became that of the ingenuous Martian who had just landed on a gorgeous alien planet ... Montaigne's que sais-je. A little light, a little wonder, some skepticism, some awe, some squinting, some je ne sais quoi. Pick a thing up, study it, shake it, skip it across a still surface to see how much felt and lively life got baked into it. Does it sail? Observe. See what can be done. 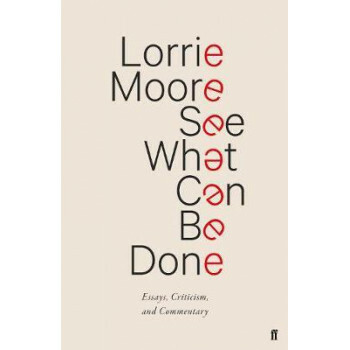 Lorrie Moore has been writing criticism for over thirty years, and her forensically intelligent, witty, and engaging essays are collected together here for the first time. Whether writing on Titanic, Margaret Atwood, or The Wire, her pieces always offer elegant and surprising insights into multiple forms of art. Crucially, Moore is a practitioner who writes criticism; her discussion of other people's work is based on her understanding of what it really takes to make something out of nothing: of what it takes to make art. This lends her encounters with books, films, and paintings the uniquely intimate quality which has made them so immensely popular with readers. In sparkling, articulate prose - studded with frequently hilarious insights - Moore's meditations are a rare opportunity to witness a brilliant mind thinking things through and figuring things out on the page.